LaDonna Gamble talks about her treatment for Marfan Syndrome. The success of the Department of Cardiac Surgery ultimately hinges on patients and how they view the doctors and staff who work here. The glowing testimonials from patients who have come through our doors indicate the hallmark of quality at this institution. They speak both to the confidence they feel in surgeons with a demonstrated skill set, but also to the focus on compassion that they see in everyone involved in their care. Below, one patient shares her uplifting experience with three separate surgeries in the Department of Cardiac Surgery. When LaDonna J. Gamble, a 59-year-old from Flint, Michigan, had to undergo three complex surgeries to fix a damaged aorta, she had no doubts about putting her trust in surgeons in the Department of Cardiac Surgery. That trust developed from witnessing the skills exhibited by Dr. G. Michael Deeb, who operated on her father with success in 1999. Her father's physician in Flint recommended that he head to the University of Michigan for treatment to get the best care. Gamble, her father, sister, brother and two sons all were diagnosed with Marfan Syndrome, a genetic disorder that affects the body's connective tissues, often causing problems within the heart. Gamble's sister, a resident of Kentucky, succumbed to the disease in 2009. 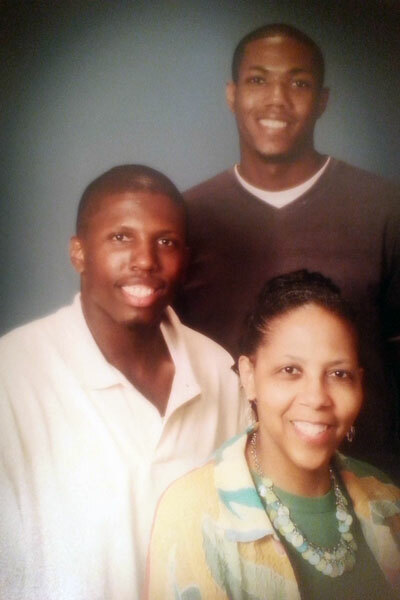 LaDonna Gamble with her sons, Anthony (left) and Trevor (right). Gamble's first sign that something was wrong occurred when she was on the treadmill and felt a sharp pain in her throat. It was just after her father had his surgery. After seeing her father and hearing Gamble's symptoms, Dr. Deeb examined her and discovered that her valve and root were in need of repair and that she, too, would need surgery. Since the procedure was too complicated to handle in one surgery, she underwent three planned surgeries. The first, in 1999, was performed by Dr. Deeb, another in 2007 by Dr. Himanshu J. Patel and a third in 2014 performed jointly by Dr. Deeb and Dr. Patel (an intervening issue with kidney function that temporarily required dialysis delayed the last cardiac surgery). The last surgery was so risky—carrying a high risk of paralysis—that LaDonna spent several days with her sons getting her affairs in order prior to coming back to Ann Arbor. "I was really thinking about whether I would survive," she said. The surgery was successful and Gamble said the nurses and doctors were involved every step of the way, from prep to post recovery. "They were very responsive and very compassionate," she says. Gamble recalls that almost every day for the two months she stayed in the hospital following her second surgery and again for the 23 days following her third surgery, Dr. Patel was there. If he needed to miss a day, he would tell her the reason for his absence and when he would be back. "I've had lesser procedures where I would stay overnight and I wouldn't get visits from the surgeons," she said. "It was really unique." Patel happily took on tasks that would have otherwise been handled by the nurses, like checking on her stitches. "He was always bright and cheerful. He was genuinely concerned about my welfare." Two years later, Gamble is feeling great. She returns to the Department of Cardiac Surgery just once a year for checkups. She considers the staff and doctors to be her friends. "I've known them long enough. I trust them immensely," she said. Of her surgeons, she says, "I know they saved my life."